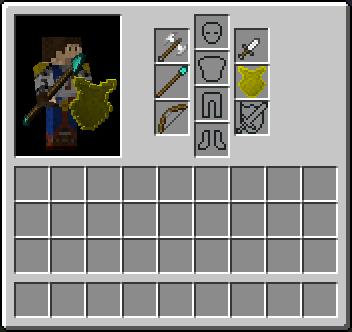 If I have in the Inventory the Items on the right, I can;t see it in F5. Pls send me Fixes. I'm using the r button to switch but it won't. is it being used for something else?? i am using Zelda sword skills with this and swords nor the shields and quivers are showing up on my back how do i fix that? I recently got an issue when I believe the launcher for MC was updated?? Also can you add the option to disable DUAL WIELD? and allow only weapon + shield combination? No hay para la 1.8? Hi, i love this mod, I LOVE THIS MOD. Super Awesome! i love this mod. super fun. 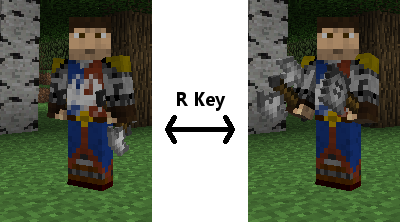 would be super awesome if you could make it compatible with "Mo'bends" or "Player animations" sheathed weapons render at your feed with some animation mods. maybe an option in the config to adjust the height they render? WHY WOULD YOU MAKE IT BLOCK WITH BOTH ITEMS ON RIGHT CLICK! like make another keybind for dual blocking but DONT REPLACE DUAL WIELD ATTACK COMBO what reason would you have for taking away the "point" (pun intended) from the dual wielding weapons you trade the defense of blocking for pure raw offensive power. Can I ask you how to modify the "R" key? Please, make a version for Minecraft 1.8.9. In planty of time thank you!